Serve up salad and crisp veggies with this exquisite duo! Part of Mariposa's String of Pearls collection. Gift boxed. Made by hand from recycled materials. Hand wash to retain no-polish finish. Mariposa’s fine metal is handcrafted from 100% recycled aluminum. 11.75"L x 3"W Handcrafted olivewood servers toss leafy greens with Mediterranean flair and the well-crafted look of an artisanal find. Each set of two richly grained wood servers is unique. 16"L x 2.5"W Handcrafted olivewood servers toss leafy greens with Mediterranean flair and the well-crafted look of an artisanal find. Each set of two richly grained wood servers is unique. 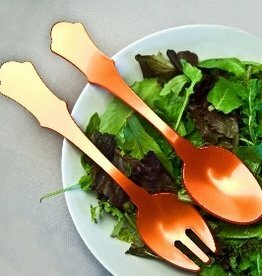 18/10 hammered stainless steel salad servers. Rustic or dressy, these look amazing on your table. Placesettings, steak knives, and hostess sets also available. The Aladdin Antique Salad Server Set in ivory features elegant pearlized handles, with the strength of high-grade acrylic and 18/10 stainless steel.